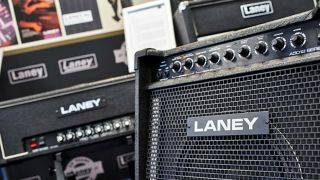 Laney Amplification blazed its way into music history 51 years ago, around the same time that (fellow Black Countrymen) Black Sabbath were formulating their plans for the creation of heavy metal. Tony Iommi, of course, would go on to be one of the brand’s principal exponents as riffmeister supreme. But a lot has changed since those heady days of heavy riffs. Today, funk, blues, jazz and country players alike are strutting their stuff with a Laney amp in their backline. Our guide is Lee Wrathe, whose fleet-fingered video demos ensure that Laney enthusiasts worldwide are kept up to date with every new development and addition to the line. We’re curious as to where the magic begins - how does R&D work at Laney? “Everybody at Laney is allowed to table an idea,” Lee affirms. “It’s really open. Any one of us could give an idea in and it would be tabled - they would consider it. There are obviously working groups that decide what’s going to go ahead, and then the design process starts. You’ve got some very traditional techniques that you are looking at in Black Country Customs. Hand-soldered stuff. But the design process itself is very modern. Next in line is the Lionheart: “Our boutique-looking, boutique-sounding amps. Glorious clean channel, twin-channel amps. That’s a single-ended Class A amplifier. A really great pedal platform: effects loop, Celestion speaker. On the 2x12 version they’ve actually got two different Celestion speakers in them, which, when you come to record, is fab because you can mix and match between the two. How much of the Celestion G12 you want and vice versa - all that sort of stuff. They’re super popular with our jazz, country and funk players. All the amps feature an overall tone control. 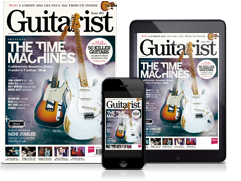 You get your usual three-band or four-band EQ, and after that entire chain of stuff there is a tone control that works like the tone control on your guitar. The GHRs will handle virtually any music style you can throw at them, but if metal is your thing, then perhaps the Ironhearts are more your style. “The fire-breathing one,” says Lee. “That’s the one that most people would associate with metal, but it is probably the most versatile amplifier that we make of the standard range. Triple-channel, so you’ve got clean, rhythm and lead. The clean channel has bags of headroom; it’s so, so clean. A lot of people are starting to use it for funk. The innovations from Laney continue. “We’re always looking at the cutting-edge stuff,” says Lee. “Being quietly progressive - although I’d hope less quiet now. We’re starting to tell people what we do. We’ve got a new YouTube channel - something we just haven’t done before, and we’re being quite interactive on that. We’re not just going, ‘Here is an advert.’ We’re trying to talk to people.